By far the most versatile device in the ADT Pulse arsenal is the lamp module, also called an appliance module. With this module, you control the electricity flowing to anything as long as it is not over 600 watts. P lug in the outdoor Christmas lights and schedule them to turn of automatiocally. Or turn on when someone walks by the camera. Pretty spiffy stuff. 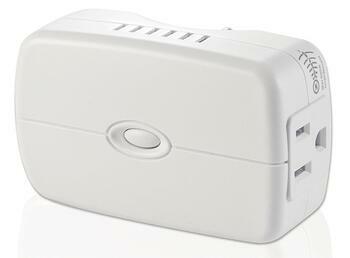 Appliance modules come in indoor and outdoor versions with dimmer or on/off functionality. For purposes of this blog, we will focus on the on/off style. The on/off appliance module, is limited in use only by your imagination and a 600 watt maximum capacity. To use the module, you only need to plug the module into the wall and plug our device into the outlet on the module. It's a simple toggle operation, meaning the module connects or disconnects the electricity that flows to what ever you plug into it. Let's take a lamp. Perhaps you would like to control the lamp that is in your front window. You will unplug the lamp from the wall, plug the lamp into the Z-wave controlled side of the module and then plug the module into the wall. Your lamp, or other small apliance stays in the "on" mode and electricity to it is now controlled by the module. Your power to the lamp is now controlled through your ADT Pulse system and can be put on a regular schedule, be part of an automation (so it triggered to togel on or off by activation of another device or event) or set up as part of a mode. That also means it can be controlled by any Internet ready mobile device by using the ADT Pulse App. Set the lights to come on daily at 5pm or a different time every day. This can be part of a mode or just your daily schedule. Set a ceiling or attic fan to rotate air whenever the air conditioner or heater comes on. Create a randomized schedule of light, television and or radio activity to make your house appear occupied when you are not home. By plugging your media centers surge protector into an appliance module, you can turn off electricity to the entire media center for the hours that everyone is sleeping. And so much more. The appliance module is the only device that it's actual purpose is left up to you. Outlets on the sides of the module so your entier outlet is not blocked by the module. The module also has a second outlet on the 2nd side so you gain a 3rd outlet on a 2 outlet plate. Only one is controlled by the Z-wave. Modules lay flush with the wall. The outlets are on the sides of the module plugs are not poking directly into the back of furniture. modules have a manual switch right on them. The module switch is great if you are sitting next to an appliance and it would make no sense to go get a mobile device to turn the light (or other appliance) off or on. You will need to have selected an ADT Pulse plan that includes automation, not just remote access with cellular monitoring. If you don't remember, go to your "Systems Tab" and select: "Manage Devices" then "Lights, Thermostats & More" from the drop-down menu, make sure that you see the Jasco Plug-in On/Off Appliance Module. If so, you are set. If you know that you can install a lamp module, proceed with these steps. Select "Lights, Thermostats & More" and follow the instructions. When asked to press the sync button, press and release the button on the module for it to pair with the system. Now you can plug in your appliance to the Z-wave controlled device on the module (the one with the Z-wave icon by it) and plug it into the wall. Test it manually with the button on the module. You are now ready to use your Z-wave module how ever you see fit. For instructions on how-to set up schedules, automations, modes and alerts for your new module, click the links. If you are not yet experiencing ADT Pulse's Home Automation features, Set up your FREE Security Review and see what you are missing or call us at 1-800-310-9490.